The organ was built in 1890 by Nicholsons of Worcester. 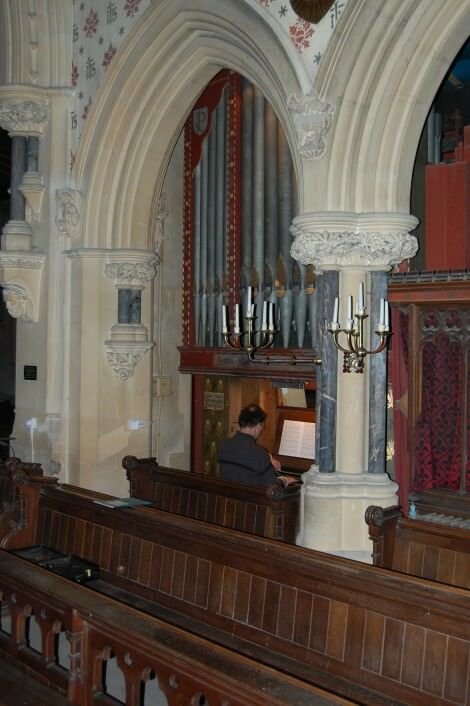 Casework and painted decoration designed by G.F.Bodley was fitted in the church around the completed organ as part of a complete chancel scheme. In 1906 the original ‘12th & 15th’ was replaced by a Trumpet, and the wind pressure raised to 3ins. The organ was ‘renovated’ in March 1947 in memory of the organist of over fifty years, George Piggott. The restoration by G&G in 2007-8 was led by Edward Bennett. The organ was unplayable due to encrusted corrosion on the moving parts of the mechanism; it was frozen solid. The damp conditions caused a build-up of mould particularly on the console. Woodworm was active in many parts of the organ, and moth damage was severe, especially inside the windchests. The theft of lead from the church roof (in early October 2007) allowed water to enter the organ; water actually leaked out of the bellows feeders! The object was to bring the organ, silent for many years, back to playing condition. Budgetary constraints meant that there were no cosmetic improvements, but the organ was made to work well. Corrosion meant that most of the pins, wires and screws had to be replaced. Moth damage meant that all the cloth and felt had to be replaced, and the pallets and the bellows were re-leathered. Apart from a split in the Swell soundboard table (which was filled with new wood), the main problem was failure of glue joints, which were re-glued. Fractures in the zinc pipe seams were re-soldered. It is expected that improved ventilation in the church, and some heating in the chancel, will keep the organ in better condition in the future. The Bodley casework, not part of our contract, may yet receive ‘conservation cleaning’ by the Churches Conservation Trust https://www.visitchurches.org.uk/.